Thanksgiving is the Most Dangerous Travel Period of the Year | Hupy and Abraham, S.C. The four-day period that marks the Thanksgiving holiday is one of the busiest times on U.S. roadways each year. According to the 2016 holiday travel study by Orbitz.com, 72 percent of Americans are planning to travel at least once between Thanksgiving and New Year’s. While this usually wouldn’t indicate anything other than increased traffic, crash statistics from recent years have shown Thanksgiving to be one of the most dangerous days of the year for fatal car accidents. Why is Thanksgiving So Dangerous for Motorists? During the Thanksgiving holiday weekend in 2014 (6 p.m. on Wednesday, November 26, to 5:59 a.m. on Monday, December 1), 341 passenger vehicle occupants were killed in traffic crashes across the nation. This alarming statistic makes it clear that with this increased number of expected holiday travelers, the potential for a Thanksgiving car accident is high. The last place any of us want to spend the holiday is in the emergency room. If you plan to drive to your Thanksgiving destination, there are a few holiday travel safety tips that will help ensure the safety of you and your family. Never drive distracted or impaired. Drinking and driving, as well as texting while driving are leading causes of accidents nationwide. Drunk driving is especially prevalent the Wednesday before Thanksgiving. 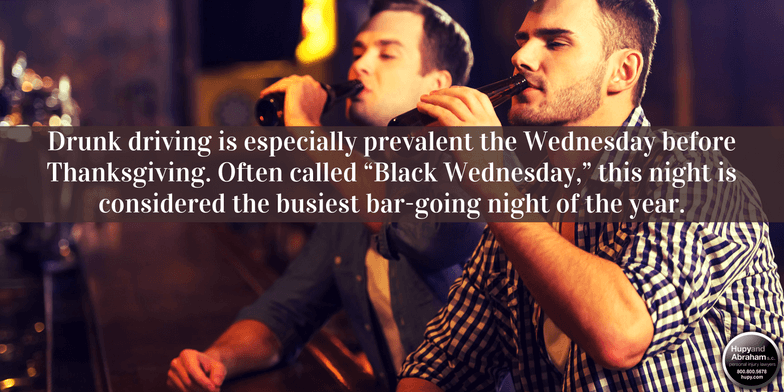 Often called “Black Wednesday,” this night is considered the busiest bar-going night of the year. If possible, drive during the day. Not only will you arrive with more time to spend with family, it will be a safer trip too. It is more difficult to see the road, other vehicles and even deer in the dark. Be prepared with emergency supplies in case of an accident or breakdown. Make sure you have a full-stocked vehicle emergency kit. In the event that you break down or are in an accident, remember to pull the car completely onto the shoulder or off of the road, turn on your flashers (hazard lights) and set out safety triangles or flares to make the vehicle visible to other drivers. Pack your vehicle with care. All cars have a load capacity that is typically printed on a label inside the driver’s side door. Make sure you aren’t overloading your vehicle with luggage and passengers. Remember to secure all loose items (big and small), as well as pets. Acknowledge “Move Over” and “Fast Lane” laws. If you see a vehicle on the side of the road, slow down and move over. But, never drive in the left lane unless you are passing traffic. This lane is reserved for faster moving traffic, and alternatively, drunk drivers sometimes drift out of their lane or into oncoming traffic. The further you are to the right of the road, the safer you are. Keeping these tips in mind, all of us at Hupy and Abraham hope you and your family’s Thanksgiving trip goes safely and smoothly. If for any reason you experience an accident this Thanksgiving due to the negligent actions of another driver, we are here to help. Contact Hupy and Abraham at 800-800-5678, or start a live chat with us anytime at Hupy.com.